Like many American families, service to our community is just as important as service to our nation. Each generation of our family business owners has served in the military. Albert Karl Hepler (aka “A.K.”) served in World War I in the United States Army before returning to take over the family’s grist mill (Clarion County) in 1918. After a fire in 1919, A.K. Hepler relocated to New Alexandria, PA where he acquired a grain and flour mill on the Loyalhanna Creek. He and his business partner, the McNaughton Family, had to close the mill in the 1940s when Army Corps of Engineers acquired the mill property as part of the Flood Control Projects. After brief ownership of a mill in Waterford, PA, A.K. Hepler relocated his family from New Alexandria to Youngwood, PA where he acquired the Lankey Feed Store on North 4th Street, across from the Methodist Church. This is where Hepler’s Hardware was born. Robert H. Hepler (A.K.’s son “Bob”) served in World War II in the United States Army Air Corps (predecessor to the U.S. Air Force). His role was a navigator on a bomber crew flying missions over Germany. Upon joining his father in the Hepler Feed Store business, A.K. proposed that they purchase the Stanton Mill in New Stanton, PA. The purchase was completed in 1950. Meanwhile, the small feed store – which moved a very large tonnage of feed and thousands of baby chickens during World War II – was at capacity. In the late 1950s, as the local agricultural economy decreased, impacting both the mill and the feed store, A.K. and Bob decided to open a full hardware business to supplement business income. They invested in a new location on Route 119 just south of Youngwood in the town of New Stanton. A.K. Hepler passed away before the new location came to fruition. Robert G. Hepler (Bob’s son “Rob”) assisted in the feed mill, and was involved with the grand opening of the new Hepler’s Hardware, which was completed and opened in 1963. Shortly thereafter, Rob went into the service during the Vietnam War. His service of six years was spent in the United States Army and with a Special Forces Unit. When he returned, he settled in New Stanton, PA with his family and permanently joined the family business. Robert is the acting owner and manager of Hepler’s Hardware, where he has worked 40+ consecutive years, and over fifty years in total. Our family strongly values service to our nation. 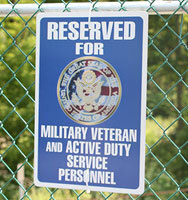 That is why we offer a reserved parking spot for military veterans and active duty service personnel (pictured above).